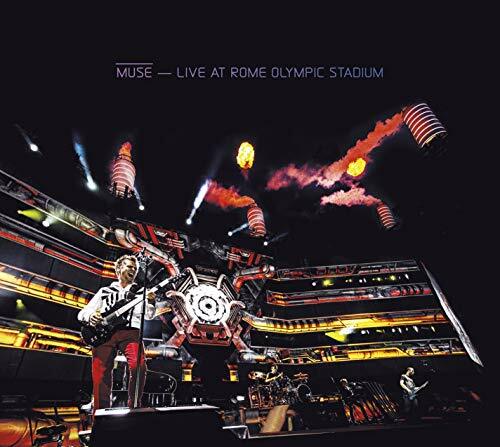 On July 6th, multi-platinum-selling British band Muse took to the stage at Rome's Olympic Stadium in front of a capacity audience of more than 60,000 euphoric fans. On December 3nd, Warner Bros. Records will release a live CD/DVD and Blu-Ray disc of that momentous evening in the Italian capital, entitled Live at Rome Olympic Stadium. The package showcases themost extravagant set build and spectacular stage show of any Muse tour todate. The band take the audience on amesmerizingjourney using pyrotechnics, expansive digital screens, and a troop of actors toaccompany their epic playlist of 20 tracks, mixed in incredible surroundsound, including hits from their most recent studio album The 2nd Law, as wellas classics such as "Uprising," "Madness," "Supermassive Black Hole," "Starlight," "Time Is Running Out," and"Knights of Cydonia."